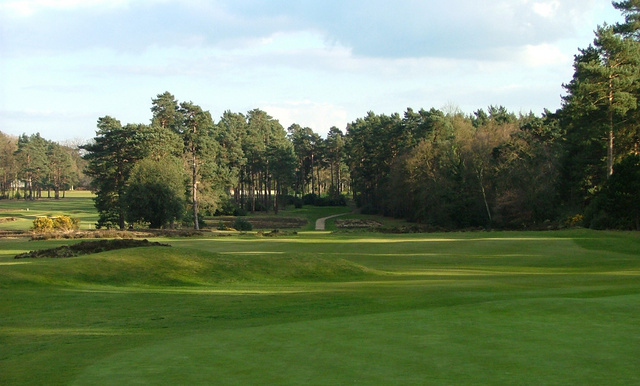 The course design is attributed to Cuthbert Butchart who became the first professional before the course was built. It has remained largely unaltered in layout but much work has gone into improving the quality of the fabric and the presentation. The watering system for the greens and tees was installed in 1981 and this has now been augmented by full state of the art fairway watering. A bunker refurbishing programme was started in 1999 and all 18 holes have reprofiled bunkers with improved drainage and carefully selected sand. Tee renovation has provided an outstanding aspect for each hole even before a shot is played. Here one can appreciate the great trees, usually far enough from the fairway, with heather intervening to provide a colourful ribbon around the semi rough. Initial tee shots, particularly the drives, must be carefully directed to the right place to set up a chance of hitting the correct part of the green if one wishes to avoid all thought of a three putt on subtly undulating surfaces. Whilst the white tees will test the skills and patience of the very best golfers, there is much satisfaction to be obtained from playing the friendlier front tees. For anyone wishing to spend a day playing golf on a mature, well designed and scenic course with the ultimate prize of a good score, West Hill must come into the reckoning. The seeming shortage of length is compensated by having five par three holes, all challenging for distance and accuracy.